GAO RFID Asset Tracking’s LocateWare is an RFID middleware that simplifies the data capture and distribution and reporting part of your project. You have made your business case. You know that by using RFID one or more of your business processes will substantially improve. You have selected the RFID technology that best addresses these requirements. Your focus is now on getting the data you need to the right users at the right time. GAO RFID Asset Tracking’s LocateWare is an RFID middleware that simplifies the data capture and distribution and reporting part of your project. LocateWare enables comprehensive tracking, locating and identification for a wide range of businesses. The suite consists of three compatible software products for radio frequency data management – RFLink, RFView and WebView. LocateWare together with GAO RFID Asset Tracking’s RFID readers will successfully capture and distribute RFID tag information to the user in a customized report format for their unique job requirements. LocateWare can support any of our networked RFID readers that are either serial connected or on an IP network and can run as a stand-alone reporting tool or can be interfaced to any corporate application. The LocateWare RFID software application is easy to implement, provides real-time information, and has a Web interface. The LocateWare suite of software simplifies configuration and reporting of an RFID infrastructure and designated assets. 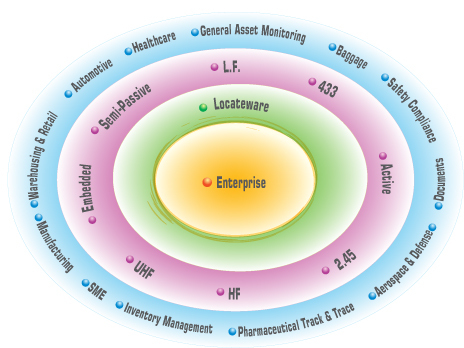 LocateWare can be deployed at department level or across whole organizations worldwide. LocateWare is a suite of three compatible software products for radio frequency data management - RFLink , RFView and WebView. RFView is a front-end software package fully compatible with RFLink. It provides powerful data management for all types of RFID application. WebView is a fully customisable front-end software package, providing web-based data presentation Compatible with RFLink, WebView is scaleable upto a multi-user ,multi-database, mul ti-site applic ation.